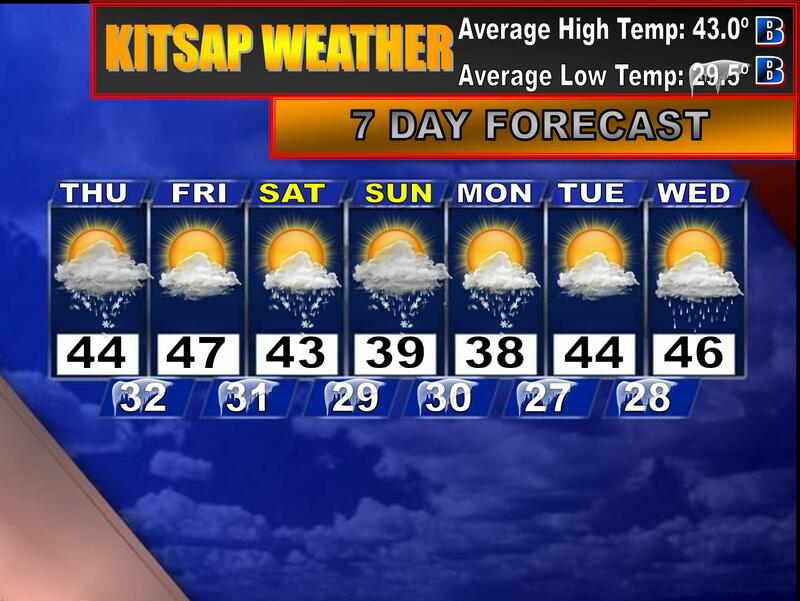 And that is my wonderful segue into the 7 day forecast, which looks more like a forecast for December or January. Some places around Kitsap saw some wet snow today mixed in with rain or hail because we experienced another sagging convergence zone! This is my main concern for the weekend: sagging convergence zones. First let’s talk about tomorrow which will be day 1 of the cold air intrusion. Skies will be partly to mostly sunny, but it’ll be chilly as highs will only make it to the mid and upper 40s. Lows tomorrow night will be near 30. Saturday is an even colder day with more in the way of clouds. Kitsap will be largely shadowed by most of the moisture in the afternoon, but the shadow weakens by late afternoon/early evening and we could see a few rain/snow showers around the area. I’m not seeing any accumulating snow right now, but it could happen if temperatures drop rapidly enough. Highs will be in the lower 40s. Sunday afternoon is another key time in the weather department as some snow, possibly 1-2” worth, could spread across most of the peninsula. Highs will also only get in the mid and upper 30s, so it will obviously be cold enough to snow, especially by sunset. A few snow showers could affect the Hood Canal area early Monday morning during a night in the 20s, but during the day the sun will come out (mixed in with the clouds, of course) and highs will struggle to make it much past 40º. Remember…our average high is in the low 50s. A few rain/snow showers could occur Tuesday before we dry out and warm up for mid to late week next week. In fact, long range models are suggesting we get quite mild and dry by next weekend. Won’t that be nice? 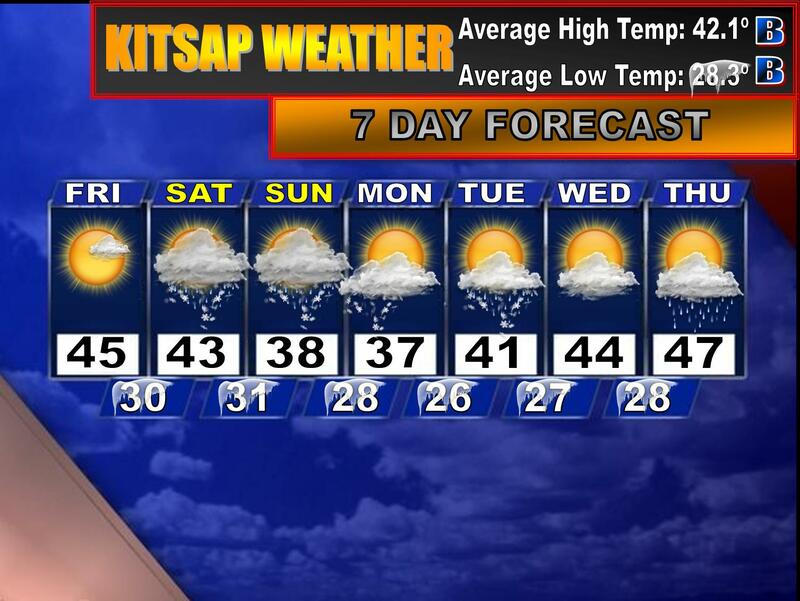 Stay tuned to Forecasting Kitsap for weather updates! A convergence zone has formed from Silverdale northward and some hilly areas around the Peninsula are reporting some rain/snow or very wet snow showers at this moment. In fact, as I type, I’m getting some rain, snow and hail in my showers. The convergence zone that started up in North King county has shifted south, bringing some Kitsap locations snow right now. Remember a few days ago when I had rain/snow in the forecast for today? I shouldn’t have chickened out and stuck with my forecast. But hey. Shoulda, woulda, coulda. The precipitation should die off by noon.